The favorability of former Alaska Gov. Sarah Palin is down in a new CNN poll out Wednesday. WASHINGTON (CNN) – Americans appear to be souring on Sarah Palin, according to a new national poll. Thirty-nine percent of people questioned in a CNN/Opinion Research Corporation survey released Wednesday have a favorable opinion of the former Alaska governor and last year's Republican vice presidential nominee. That's down seven points from a poll conducted in May, and it's also nine points lower than the 48 percent who now say they now view Palin unfavorably. Forty-three percent viewed Palin negatively in May. "Most of that change has come among Republicans and conservatives," says CNN Polling Director Keating Holland. "GOP voters still like Palin - two-thirds continue to have a favorable view of her - but she is not as wildly popular among GOPers as she was in the spring, when eight in ten Republicans had a favorable view of her." It's unclear if the drop in Palin's rating is due to her resignation as Alaska governor, a year and a half before her first term ends, or if anything else she has done is contributing to the dip in her numbers. The poll was conducted July 31 through August 3, before national coverage of Palin's stinging criticism of President Barack Obama's health care reform proposals. 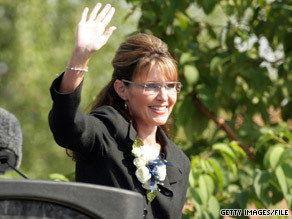 Palin is considered one a number of Republicans who may want to make a bid for the 2012 GOP presidential nomination. "A 39 percent favorable rating makes it that much tougher for Palin to become president should she decide to run in 2012. Her favorable rating is almost identical to the numbers that former vice president Dan Quayle got just after leaving office in 1993," says Holland. Quayle formally declared himself a presidential candidate in 1994 but withdrew from the race in 1995. The CNN/Opinion Research Corporation poll was conducted by telephone, with 1,136 people questioned. The survey's sampling error is plus or minus three percentage points for the overall sample and plus or minus 6.5 percentage points for the questions of Republican respondents.